In a fourth-storey apartment block close to the centre of Kenya's capital, Nairobi, 30 young men and women are crouched in front of computers. Some are working in what used to be one of the bedrooms, and the others are in the former sitting room. They are the vanguard of an industry in Kenya that is waiting to take off. They are employees of Preciss International, an out-sourcing company run by Mugure Mugo. She set up the company five years ago with one colleague. "I did the marketing and contract work, my one employee did the data processing," she says. "I checked it in the evening and we sent it off the following day to the client." Her office, by the way, is what used to be a guest bedroom in the apartment. Since those early days the business has expanded and is about to grow bigger still with the backing of an investor. 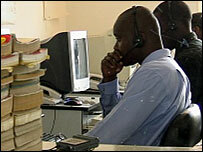 Kenya has all the right ingredients for outsourcing work, except one: communication speeds. "We are held back by the fact that all our data and calls go via satellite," Ms Mugo says. "This is very expensive and is one of the big obstacles to growth." Preciss International has a young, very well-educated workforce and have picked up a big multinational client along with a host of smaller ones. In the bedroom, a "data clean-up" exercise is taking place, where Preciss employees are calling companies all over Africa, checking on names, addresses, phone numbers and email addresses. Next door in the sitting room, three people are working on subtitling American and British television programmes for the deaf. "It's good business," says MS Mugure, "But it takes ages to download the programmes, and that adds to our costs." The price of satellite bandwidth is prohibitively high in Kenya and other East African countries. A megabyte of satellite-delivered bandwidth in Kenya costs around $7,500, whereas elsewhere in the world a megabyte costs no more than about $400. This huge price difference has been a brake on many other businesses as well. It has taken a long time, but at last slow connection speeds and expensive internet access are about to end in Kenya. In the next few days, the Kenyan government will sign a deal with a French/US engineering company Alcatel-Lucent, to commission a fibre-optic cable from Fujaira in The United Arab Emirates along the sea floor of the Gulf of Oman, down the East African coast to the port town of Mombasa. From Mombasa, the government plans to weave a network of fibre-optic cable throughout the country. It will be welcomed with open arms in the Browse Internet Access cafe in the centre of Nairobi, where dozens of people are sitting in front of their flat-screens tapping away at the keyboards. The internet speeds at the cafe are fast by Nairobi standards and reliable, but painfully slow compared to what should be available. Sami Seram is a student. He comes to Browse because the computers at his university are even worse, but he finds doing his bio-chemistry online research very slow going. I watched him, waiting while a relatively straightforward page of script was downloading. "Look at this," he says. "It's so slow. It takes me a very long time to get hold of what I need, and it's very expensive." Mr Seram reckons he spends about 500 Kenyan shillings a week on internet connections - that is about $7.50. In a country where the average annual wage is less than $1,500, this amounts to a substantial outlay, particularly for a student. Stephen Onyambu, the boss of Browse says with the cost of satellite bandwidth so high it is impossible to offer internet access any cheaper. "We have had to cut our margins down and down," he says. "But wait, once the fibre optic comes we will be charging just a few cents for internet time." Work on laying the fibre-optic cable is due to start at the end of the year. The ocean floor has been surveyed and now the huge pipe must be laid in an $82m operation. Alcatel-Lucent have committed to finish the project in two years. Bitange Ndemo, permanent secretary at the Kenyan Ministry of Communication and Information, says they won the contract on cost and speed of delivery. He says neighbouring countries and territories like Ethiopia, southern Sudan and the Democratic Republic of Congo have already asked to be connected. He is optimistic about what the fibre-optic cable will deliver to Kenyan business, but the real prize, he thinks, is to be found in rural Kenya. "For the youth here - this is going to be such a massive change," he says. "Many villages in Kenya are being put on the electricity for the first time, and we will give these villages internet access as well. "Suddenly, these young people in schools who knew only their immediate surroundings will have the whole world opened up to them." It is an enticing prospect but, realistically, it will still be a long time before Kenya is all hooked up to the worldwide web.